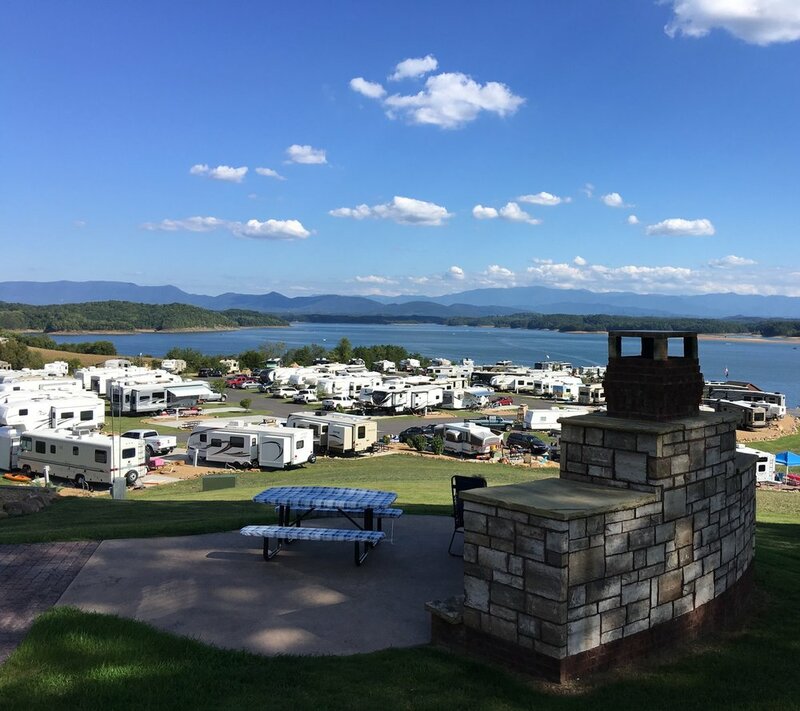 Located on Douglas lake with gorgeous views of the great smoky mountains, this premiere RV resort features 160 to 170 spacious lake front and lake view sites. They have fire pits/ outdoor fireplaces, full hookups (water/sewer/electric), free wifi, cable tv hookup, picnic tables, bath house with private bathrooms, laundry facilities, playground, sandy beach area with lake swimming, beach volleyball and golf cart rentals. Anchor Down RV Resort is pet friendly and has easy access to a boat ramp. Located on Cherokee Lake. From town, go 1.5 miles west on U.S. Highway 11-E, then follow signs 4.5 miles north. Call (800) 882-5263 May through September. They have 41 camp sites, bath, grills, flush toilets, showers, picnic tables, swimming area, boat ramp and fishing. The Group Pavilion has one electrical outlet with two plug-ins, 10 tables that will seat up to 50 people, 1 large charcoal grill, handicap accessible, restrooms, furnished water and horseshoes and stakes. FREE facility use: first come, first serve, no reservations required. Located on Douglas Lake. From I-81 ;.take exit 424 go straight for 1.5 miles until 1943 Oak Grove Road, Dandridge. Call 865-397-2998 or 800-882-5263 March through November. They have 100 camp sites, flush toilets, showers, electric and water hook-ups, sewer, boat ramp, picnic tables, tennis, swimming pool and fishing. ﻿Located on Douglas Lake, take exit 415 off I-40 and go toward Dandridge, about a 10 minute drive to 2527 Inspiration Point, Dandridge. Call 865-397-6518 April through October. They have 50 camp sites with full hook-ups, camp store, bait, ice, boat ramp and fishing. ﻿On Douglas Lake. Family Vacation, RV Resort, Cabin Rentals, and Camping on Douglas Lake, minutes from The Great Smoky Mountains of Tennessee, Gatlinburg TN, and Pigeon Forge TN. Call 865-397-4080 year round for more information on this great resort. Overlooking Douglas Lake and the Great Smoky Mountains, this family owned business is a quiet, relaxing park conveniently located to Gatlinburg, Knoxville, and Asheville, NC. Offering full hookups with water/sewer, and internet/cable available. Monthly and annual leases available. 1420 Hwy. 139, Dandridge, TN 37725, (865) 440-9850. Located on Douglas Lake, take exit 424 off 1-40 onto Highway 113, go to the stop sign and take a left, go across the lake, located at the end of the bridge at Highway 25/70. Call 865-397-2182 year round. They have 65 camp sites with full hook-ups, five cabins, store, showers, boat ramp and fishing. Located on Douglas Lake. Take exit 417 off I-40 and go two miles west of Dandridge to 570 Terry Point Road. Call 865-397-7928 from March to October. They have 171 camp sites, a store, snack bar, swimming pool, laundry, recreation room, boat launching, full or partial hook-ups.